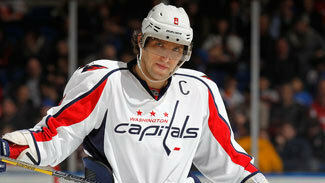 ARLINGTON, Va. -- Alex Ovechkin has been the target of quite a bit of criticism during the 2012-13 season, as both he and the Washington Capitals were not producing at expected levels. The puck is going in the net again for the two-time Hart Trophy winner, and whether or not his play on the ice is approaching previous seasons, Ovechkin's personality was certainly "back" Monday at the team's practice facility. "Right now I'm scoring goals and I'm king of the world," Ovechkin said. "Couple weeks ago, I was, you know, almost in the toilet. Maybe [they] just forget to flush me. It is kind of a situation where I don't care right now." His tone was sarcastic and the retort to his critics was biting. While Ovechkin may never again reach the historic heights he found earlier in his career, the shots on goal were still there when the goals weren't earlier in this truncated campaign. Ovechkin is tied for the League lead in shots on goal with 136, and after a seven-game binge his name is starting to shoot up other leaderboards as well. The Washington captain has seven goals and 11 points in the past seven games, and now has 16 goals and 31 points in 32 games. "If you look at his stats, I don't just pay attention to the stats, but if you look at them I think they're the same," center Nicklas Backstrom said. "He has a lot of shots every game. So it is a lot of shots and sometimes they go in and sometimes not. He's been here for a while, and maybe [teams] were reading him a little better but now he's a right wing and that mixes it up. It has been going good for him the last few games, and hopefully we can keep him rolling. "He's always been in a good mood. I think something with him is he's always kind of happy. He's a goal scorer and he wants to score. You can see that out there, but he's never been in a bad mood or anything so that's been good." Ovechkin has at least a goal in five straight games -- he hasn't scored in six straight in five years. He also has 35 shots on net in the past seven contests, which ties his best seven-game stretch of the season and would amount to the fourth-highest total of his eight-year career if he were to play 82 games. This seven-game stretch, during which Washington has won five times to surge back into playoff contention, coincides with Ovechkin being reunited with Backstrom. They have been apart for much of the season -- longer than they have at any point since Backstrom's rookie year. Much of Ovechkin's offense is still coming from the power play, but he does have three even-strength goals in the past five games. That is the same number he had in the first 27 games of the season. "I think me and [Mike Ribeiro] have good chemistry together," Ovechkin said. "Of course with [Backstrom], we've played almost our whole career here. It is not a surprise we have good chemistry again." This season has been one of transition for Ovechkin. He is working with a third coach in less than two seasons. He is playing a new position. The Capitals are also in a position to which they're not accustomed. After a terrible start, they are in danger of missing the playoffs for the first time since Ovechkin's second season in Washington. They have won three straight and five of seven, though, and the next couple weeks will be a critical stretch of winnable games. Six of the next seven games are against teams currently between 10th and 15th place in the Eastern Conference. Washington doesn't need Ovechkin to score every night, especially with Brooks Laich and Mike Green returning to the lineup, but they do need him to be one of the best players on the ice on a consistent basis. That is something he's been the past couple weeks. "He carries us, and he brings an enthusiasm that is right through the lineup," coach Adam Oates said. "We score a power-play goal last night and then he gets one and for 10 minutes we were … they couldn't touch the puck. That's one of the things he brings. I'm trying to tap into that as much as I can all night long. "He is still our main focus with scoring. Every team draws up their game plan and he's the first guy they think of. I know he wants to score goals and he expects to. We do, too. I'm going to try to put him in every single situation I can so that he will score, but during the course of 60 minutes there is still a lot more hockey to be played where he has to be a part of it."